Palm Treo 650 - why I still love the Treo - recommended multimedia and office applications for the Palm. Recommended multimedia and office applications for the Palm. Power up your Palm with these great applications. Although other phones might be able to fit in more whizz-bang features, I reckon that Palm's combination of usability, stability and a no-nonsense interface makes it one of the best around. Here's our short guide to some of the best applications about for the Treo. When it comes to multimedia, the Treo isn't exactly up there with the big boys, but the basic Real Player plays back MP3 files loudly enough, although serious music fans are advised to head straight to Pocket Tunes to download a far more capable player. Some serious music fans swear by Motion Apps' mOcean MP3 player, which comes with an iPod-like interface and has the ability to sync with their iTunes library. 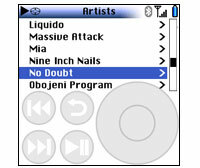 For more of an iPod experience, users can install the 'Magic Button' software and control MP3 playback (Play, Stop, Prev and Next track, forward and rewind song) via the phone headphones. Although the built in camera can only muster QVGA (320 x 240 px), or VGA (640 x 480 px) resolutions, the quality is sharp and bright and puts many phone cameras to shame (some of the i-mate cameras are particularly awful). 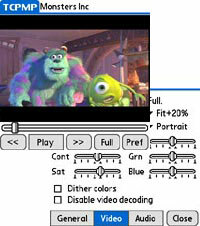 Again, video recordings are nothing to get excited about (QCIF 176 x 144 px or QVGA 320 x 240 px), but the simple interface for taking stills/video and viewing multimedia files far outshines its fiddly Windows equivalent (I've lost count of the amount of times I've accidentally launched the camera app on our JAM smartphone). It's also possible to encode DVDs and play them back through the Treo using the open source The Core Pocket Media Player, which can play just about any file you lob at it and - best of all - you don't have to re-encode video files to fit the 320x320 screen. With TCPMP you can just slap the file to your SD card and you're ready to go! Although it's only for US customers, Treo owners can also enjoy more than 20 channels of Mobile TV for a subscription charge. Keen bloggers can use software like SplashBlog to upload their own photoblogs direct from their Treos, while more experienced users can might want to use the powerful mo:blog blogging app. Of course, if you're hoping to make the most of your Treo as multimedia device, you'll have to fork out for a SD card, as the phone comes with a miserly 23meg of user-memory (although it's worth noting that Palm applications often weigh a lot less than their Windows counterparts). You'll also need a launcher application like the excellent Launcher X to free up space by running programs off the card. Seeing as I wanted to use our smartphone primarily as an organiser/office tool/phone, I needed a powerful, flexible PIM that wouldn't baffle me with arcane menus and never-ending lists of options. Despite investing long hours trying to learn the leading Agenda Fusion and Pocket Informant PIM applications on the Pocket PC, I found that there's nothing that even comes close to the splendidly simple but deceptively powerful Iambic Agendus application on the Palm OS. When partnered with the optional Agendus Windows Desktop application, the program is a masterclass in interface and usability design and is - in our opinion - a good enough reason to move to the Palm OS alone if you're after a world class PIM. Despite the enhanced feature set, more powerful processor and more modern software, I constantly found Windows Mobile to be a frustrating experience, with many functions unnecessarily complicated. Even with Microsoft's own products, the Palm did a better job, with the bundled Documents to Go application on the Treo proving far more effective at handling Word, Excel and PowerPoint documents than its Microsoft Mobile counterpart. It's the same story with SMS, with the built in text messaging interface on the Palm remaining streets ahead of its Pocket PC rivals, with the superb auto-threading conversations making it easy to keep track of text conversations. It really is a delight to use. Being a mature platform, the Palm OS has grown has a ton of capable, office-related, third party programs for taking care of finances and budgeting, databases, project management and travel etc., so you're sure to find something for your needs. In our next installment, I'll be looking at Palm's connectivity and having a moan about the lack of Wi-Fi.